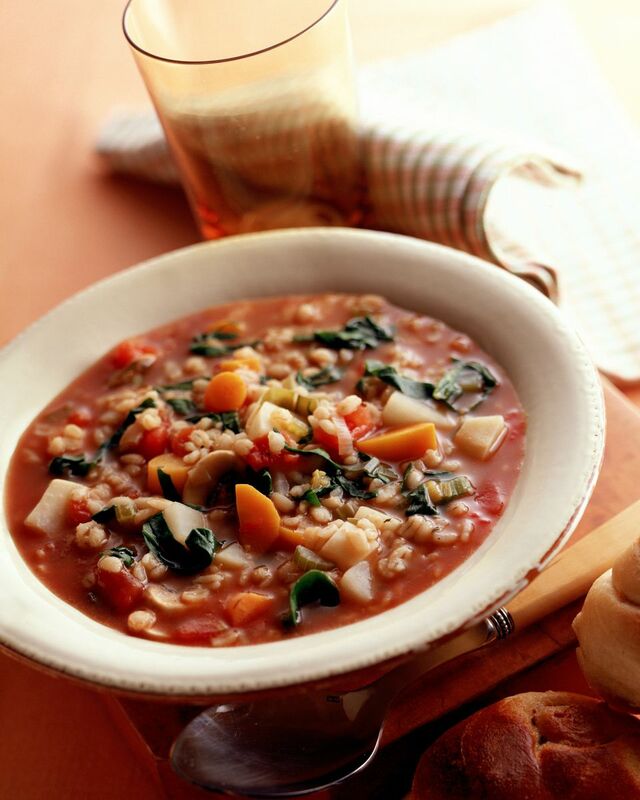 This thick and hearty vegetarian Crockpot Barley Vegetable Soup recipe is packed full of nutrition. With barley, tons of veggies, and sweet potatoes, no one will miss the meat. And the recipe is so easy to cook in the slow cooker. When you get home, the aroma that will greet you as you open the door is mouth-watering. Barley is a wonderful grain to cook in the slow cooker. Be sure that you buy pearl barley, which has had the outer hull removed so it will be tender when it's done cooking. Barley is packed full of fiber, which may help to prevent some types of disease such as cancer. And it tastes delicious! It has a mild nutty flavor and chewy but tender texture you'll love. You can use any vegetables you'd like in this hearty recipe. Use russet potatoes in place of the sweet potatoes, add sliced summer squash or zucchini, add parsnips or rutabagas, or stir in some frozen sweet peas along with tomatoes at the end of cooking time. The soup is very tolerant, which means you can add or subtract ingredients and it will still be delicious. This soup freezes well too. Make a big batch and eat some tonight, then freeze in 2- or 4-cup portions in a solid freezer container. Label the soup, add the date it was made, and freeze up to 3 months. To serve, thaw in the fridge overnight, then heat on the stove top until the soup bubbles and is thoroughly heated. Serve this soup with some toasted cheese bread, a glass of red wine, and a green or fruit salad on a cold winter night. Place all ingredients except the can of diced tomatoes in a 5-6 quart crockpot in the order given. Do not stir. Cover crockpot and cook on low for 8 hours. Stir soup and add tomatoes and baby spinach; stir again to combine. Cover crockpot and cook for 20 to 30 minutes longer until soup is hot and spinach is wilted. Remove and discard bay leaf before serving.